The VHT Tour™ uses the high-impact first impression of VHT's Professional Photography to create the most alluring video property tours in the industry. VHT's Video Editing Specialists use VHT's Professional Photography to produce tours custom-tailored for television, websites, internet, digital signage, DVD's, and mobile devices. The VHT Tour™ is available in three options to effectively market your diverse listings — Music, Music & Narration, and Custom. YourTOUR™ is a high-quality video property tour using your pictures. You simply upload your pictures and the professionals at VHT Studios take care of the rest. 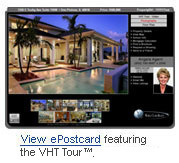 Your pictures are optimized and crafted into an engaging property tour with dramatic movement and flow.